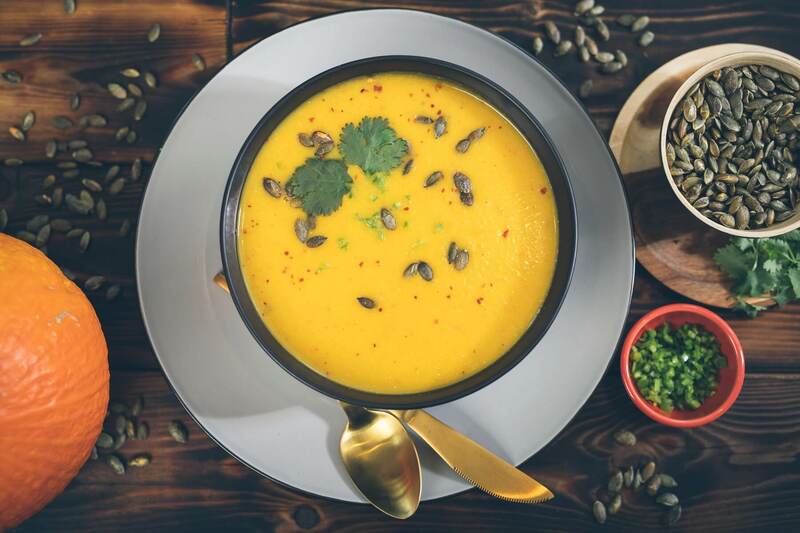 For this spicy pumpkin soup recipe, save the flesh from your Hallowe'en pumpkins (it's suitable to freeze) and cook up this tasty, healthy and nutritious soup. Add a glug of rapessed oil or olive oil to a large pot over low heat and add the onions. Sweat gently until they go translucent, then add the chopped garlic, ginger and chilli flakes. Cook gently for another minute or so and add the pumpkin flesh and carrot. Add the stock and coconut milk, turn up the heat to medium, cover the pot and bring up to a simmer. Simmer for about 45 minutes or until the veg is tender. Do not let the soup boil rapidly. Let cool a little and then blitz until smooth with a hand blender. If you don’t have a blender or want a more rustic texture, drain the liquid from the soup into another pan, mash the vegetables and then put it all back together again. Serve in bowls, topped with a sprinkle of fresh chilli, some toasted pumpkin seeds and fresh coriander leaves.